An electronic portfolio, or eportfolio, is digital collection of artefacts demonstrating a person’s experiences, achievements and knowledge. As a personal online space, an eportfolio offers learners, employees and members of professional associations an opportunity to manage their own information and learning, and can use them for assessment, professional development or to promote themselves. People use their eportfolio to reflect, plan, collaborate and share their work. Group Eportfolios are used by a group of people to showcase what has been done for a project or grant funding they may have received. As a personal online space, an eportfolio is managed by the learner, employee or member and can be used to storage information which can be used and re-use for different purposes and different audiences. This information can also be sourced from a variety of locations such as blog posts, or information stored on Twitter, YouTube or Slideshare. This means that the eportfolio acts as the ‘control tower’ where a person can gather information from across the net. 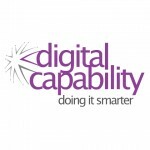 If you are interested in getting started creating your own eportfolio or doing this with a small group of learners, employees or members as a pilot, you can do this at the Digital Capability – Doing it Smarter Mahara Eportfolio Service. Pingback: What should your digital profile look like in 2014?